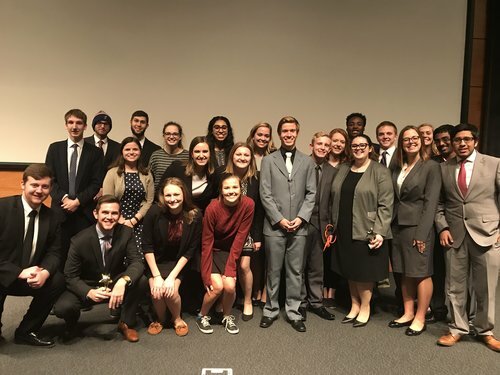 In the fall of 2017, KU Mock competed at Drake's Richard Calkins Invitational, Creighton's Blue Jay Open, and St. Olaf's Ole Open. Below are the results and awards. Attorney Awards: Kendra Rodecap 19-π (Team 29029, 1378), Monica Maurer 19-∆ (Team Arrested Dyl-Velopment, 1376), Mackenzie Aden 19-π (Team Souper Soups Squad, 1377), Sam Fenton 19-∆ (Team Souper Soups Squad, 1377), Robert Santamarina 18-∆ (Team 29029, 1378). Witness Awards: Nate Milford 19-π (Team Souper Soups Squad, 1377), Harneet Sanghera 16-∆ (Team 29029, 1376). Attorney Awards: Sam Fenton 20-∆ (Team Souper Soups Squad, 1377), Robert Santamarina 19-∆ (Team 29029, 1378), Mackenzie Aden 17-π (Team Souper Soups Squad, 1377), Zach Kelsay 17-∆ (Team Arrested Dyl-Velopment, 1376). Witness Awards: Emily Depew 19-∆ (Team Arrested Dyl-Velopment, 1376), Robert Santamarina 16-π (Team Souper Soups Squad, 1377), Nidhin Ninan 16-∆ (Team Souper Soup Squad, 1377). Attorney Awards: Robert Santamarina 20-∆ and 19-π (Team 29029, 1378), Caitlin Riffer 19-∆ (Team #GirlPower/Arrested Dyl-Velopment, 1376), Mackenzie Aden 18-∆ (Team Souper Soups Squad, 1377), Zach Kelsay 18-π (Team #GirlPower/Arrested Dyl-Velopment, 1376).